1. The current owners are retaining a major stake in the company. 2. The valuation is very reasonable. We've seen some pathetic IPO's recently. Notably have been the real estate "bank check" IPO's -->> basically raising money to buy up real estate assets they perceive to be cheap. These deals have done poorly because management has had little to no stake in the newly public company. 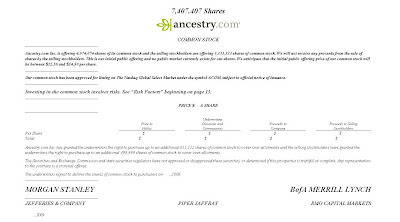 Ancestry.com (ACOM) shares priced this morning at $13.50 on their first day of trading. They traded as high as $15.50, and are now at $14.50, the high end of the expected offer range. As I said, the current management will be heavily invested alongside those purchasing shares in the IPO. And most notably, the venture backers seem to be only selling a tenth of their position. VERY positive news. The valuation isn't bad either. Revenue grew 13% for the first 9months of this year. At first glance that seems rather low growth for a brand new IPO, but keep in mind this company's services are among the most discretionary purchase possible, right??!! Example -->>"Hey honey, I know money's tight, but I'm gonna do an ancestry search, ok?" Costs are being very diligently managed, and non-cash amortization expenses for the first three quarters of this year ran at almost the same level as net income, understating cash flow. The company's current market value, based on where the shares are trading, is about $625million, or about three times this year's expected revenue. Not bad at all. Price to earnings of about 24times TRAILING net income, is not bad, especially for a leverageable operating structure with 80% gross margins. 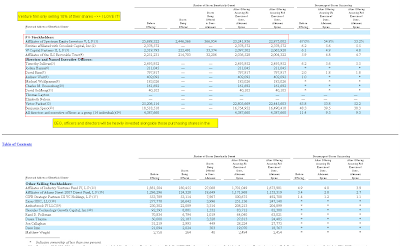 Free cash flow yield of about 5% right now is lower than AlphaNinja readers typically see me cheer, but this is an IPO - most new issues aren't even PROFITABLE, let along throwing off free cash flow. Good for these guys- I wish more IPO's were put together so well.